and when i close photoshop dexpot switch to desktop 1 again , can i do it? i mean can Dexpot do it? Re: can i activate desk2 when ps start and go back to dk1 when i close it? you'll need to use 'Configure Desktops > Start-up' to do so. Sebastian wrote: you'll need to use 'Configure Desktops > Start-up' to do so. could you post some screenshots please and a steps by steps? 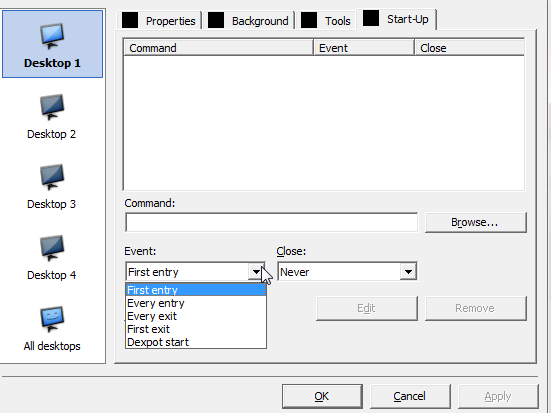 2) what kind of rule should i do with configure desktop ? can somebody test it? maybe it's a bug? regarding your screenshot: this will run VLC when you switch from desktop 1 to 2 for example. 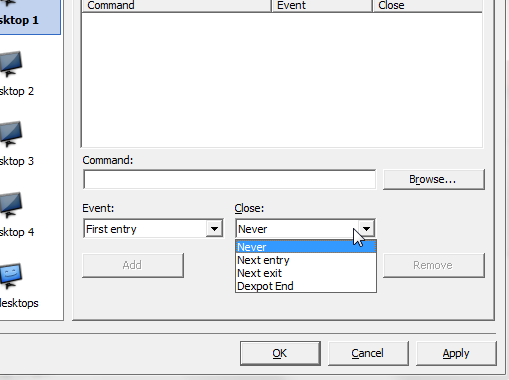 You can't have Dexpot switch to a specific desktop when closing VLC. Sebastian wrote: regarding your screenshot: this will run VLC when you switch from desktop 1 to 2 for example. 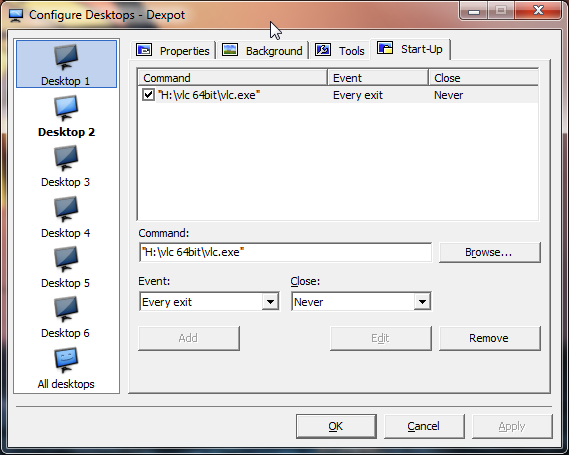 You can't have Dexpot switch to a specific desktop when closing VLC. may i ask ? can i ask a request ? for example i have 6 desktop , 1 desktop clean , 2 desktop word, 3 desktop photoshop , 4 desktop chrome or firefox ..
the ability to set up when i close microsoft word switch to desktop 1 or 4 ..
what do you think ? can i ask?